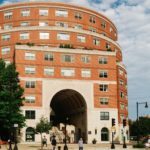 West End Place is a ten-story brick building, with a large archway, presiding over Lowell Square (in Boston) at the intersection of Staniford Street, Causeway Street, Lomasney Way, and Merrimac Street. Take the MBTA to North Station, or drive to the North Station area (TD Garden/North Station, Causeway Street). Approaching from I-93 underground, take exit 24 for Government Center. The entrance to West End Place is on the right of the large archway, where you will find the concierge and intercom system. Parking spaces at West End Place in the garage beneath the courtyard are fully leased to residents or owned by shareholders who are residents of the condominium. There are no spaces available within the condominium garage for guests. However, there are a number of options for parking close by. Located at 60 Staniford Street, Boston, MA 02114. It is operated by Propark America (617) 742-8025. Rates range from $12/hr to $48/day. Special rates for events. 565 available parking spaces. Monthly parking passes available with a discount for residents of West End Place. The garage is fully automated, and there are no attendants. Located at 50 New Sudbury Street, Boston. The parking rates range from $8 for 20 minutes to $39/day. Discounted rates for nights and weekends. Increased rates for event parking. Monthly parking passes available. Vouchers can be purchased at the front desk of West End Place. Weekday vouchers for Monday through Friday from 5:00 am to 5:00 pm are available for $20 and weekday night vouchers are available for $9 per voucher. Weekend all day vouchers (24 hours) are available for $9 per voucher. To use a parking voucher, park in the normal manner taking a regular ticket upon entering the garage. When leaving the garage, proceed to any garage exit, insert the parking ticket, and then insert the chaser voucher as the form of payment when prompted. The chaser voucher will be accepted as either full or partial payment for parking. If applicable, insert a credit card or cash for the remaining balance.